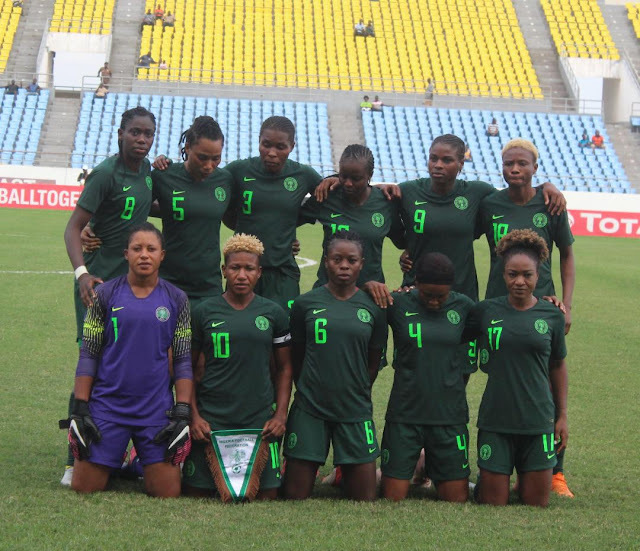 Captain Onome Ebi has declared that the Super Falcons are in the right frame of mind to give their all and subdue Cameroon’s Lionesses in Tuesday’s Women AFCON semi-final battle in Accra. “We are in very high spirit. The entire team is well motivated. Our immense gratitude goes to our father, the President of Nigeria, President Muhammadu Buhari, as well as the NFF led by its President, Mr. Amaju Pinnick. The Government has done well to put us in good frame of mind and the NFF has done their own part. It is now for us to repay the good gestures. The Falcons arrived Accra on Sunday and trained at the Priesec School in Legon, ahead of the official training at the Accra Sports Stadium on Monday evening. Reigning African Woman Player of the Year, Asisat Oshoala, added: “Our captain has said it all. We are here and we are very happy because our welfare is being attended to. We have received from the NFF the things we have asked for, and we believe they are ready to do even more if we also do more. “Losing to South Africa in our first match is a big lesson we have taken to heart, but we have put it at the back of our minds having learnt from it. Any team can lose if it doesn’t give its all, or fails to come to the party.